National Parks Adventure treats us to spectacular sounds as well as sights: in Wyoming, the "molten fury" of Yellowstone's magma chambers and the "highly developed vocabulary" of the prairie dogs at Devils Tower; in Michigan, the cracking crash of ice displaced by climbers at Pictured Rocks National Lakeshore; in Arizona, the roiling foamy rapids encountered by Colorado River rafters in the Grand Canyon. John Muir's role early on in helping to protect natural lands — along with Theodore Roosevelt's — is highlighted, and we hear a voiceover quoting Muir as he urges us to "get close to nature's heart" by visiting them. The best way we can celebrate our parks, of course, is to hike in them or climb or raft or explore history or just sit and soak up nature. I'm counting the weeks until I return in September to Yellowstone and again immerse myself in science and nature. But there's a second way, too. We can realize what Muir didn't mean by "get close to nature's heart." We can think what narrator Redford does mean when he says, referring to the wildlife in our parks, "These lands are their lands, too." We can respect the wildlife in our parks. 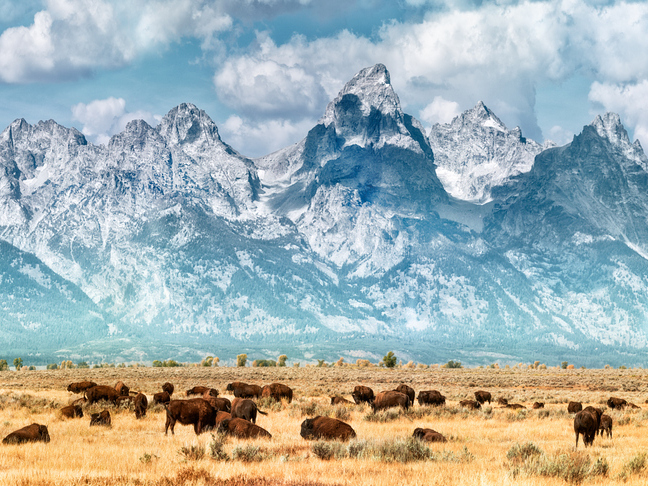 "Federal and state regulations prohibit the transport of bison out of Yellowstone unless those bison are going to meat processing or scientific research facilities. We are working to establish quarantine facilities for bison so that they can go through the months-long testing protocols for brucellosis and, if negative, be used to start conservation herds elsewhere. However, the use of quarantine for bison hasn't been approved, nor would a newborn calf that's unable to care for itself be a good candidate for quarantine. So, why wouldn't we try to care for the calf on our own? It may be hard to imagine that Yellowstone does not provide direct care for its animals. What we do provide is a space for animals to live their lives with as little human intervention as possible in today's world. A bison raised by humans in captivity would probably never be returned to the wild...It's really important to understand that national parks are very different than animal sanctuaries or zoos." There are lessons for all of us here. The National Park Service people mean it when they say they're not a zoo and they're not a sanctuary. We see that wild bison are sometimes sent to meat processing plants, but the point I want to make today is that we need to really understand that our own actions can doom animals to dying. In 2015, the main cause of the 61 grizzly bear deaths in the Greater Yellowstone Ecosystem (which includes lands outside the national park) was human interaction, including hunting and being hit by cars. Scarface, a bear beloved inside Yellowstone National Park, was killed by a hunter outside the park. OK, most of us don't go to wilderness areas to hunt. But we do go to hike, and if wild animals feel threatened and attack hikers in the parks, it's not unusual for them to be killed in the name of public safety. Just this week the Washington Post reported that a black bear was killed after a camper in North Carolina's Great Smoky Mountains National Park was mauled by a bear. The "wrong" bear was killed. I'd love to argue the ethics of these killing policies with the Park Service (and probably will), but the fact remains, all of us who visit national parks need to know the reality of the situation. I don't mean to compare hikers' behavior to that of the tourists who put the bison calf in the car, and obviously I'm not suggesting that it's wrong or thoughtless to hike in national park lands. But when we venture into nature's heart, we need to do it with our brains fully engaged. We can avoid hiking into areas with active bears, especially cubs, and if we do go we can follow recommendations for carrying bear spray (while realizing that bear spray isn't always effective). We can refuse to succumb to the "taking selfies" trend that puts us way too close to wild animals. We can pledge never to crowd close to, feed or touch any wild animal in the parks. Achieving these goals would be a major cause for celebration.